CCKB rolls- US$ASK price perfect new. Monthly loads available. Very low pricing, clean and well above average quality. Fast shipment we want repeat business! New Containers. Dry Rolls,Wrapped. Good cores. All rolls go clean. Containers have no holes. 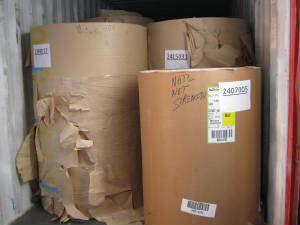 Color recycled kraft linerboard rolls. Full diameters 58" = 147 cms. Clean, not for high speed rewinders. Ex US as always. US$ask metric ton most ports. Excess SBS Rolls all export. rolls on site. So this is a good option to buying new rolls.